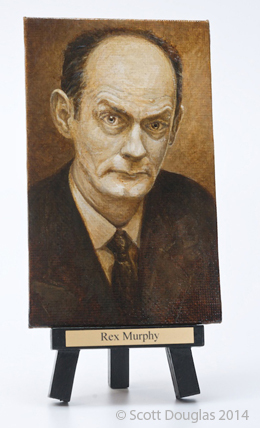 Earlier this year I started a new series of portraits of Canadians, The first one I did was of CBC’s Rex Murphy followed by a portrait of Victoria Mayor Dean Fortin. I met the mayor today and presented the painting to him. I was thrilled when he said it was “more than amazing”. I plan on doing fifty of these and have two more in progress right now. They are three by five inches, acrylic on canvas. This is the latest portrait I’ve done in the Held series. Like the others I painted it on my iPod touch. This one is based on a mugshot from the 1920’s. The third series I’ve been working on is portraits of my family. My son was interested in the portraits that have become the Held series and asked if I would paint his portrait, too. I had him sit for me a few times. I don’t think I’ve completed a piece that I’ve had as much emotional investment in before. 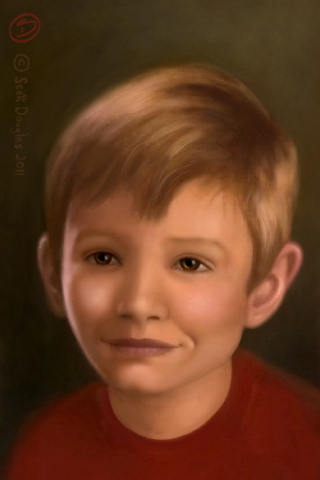 He wore that red shirt specially for this portrait – it’s actually a Smurfs shirt. I didn’t put that in, though, as I thought it would be distracting. 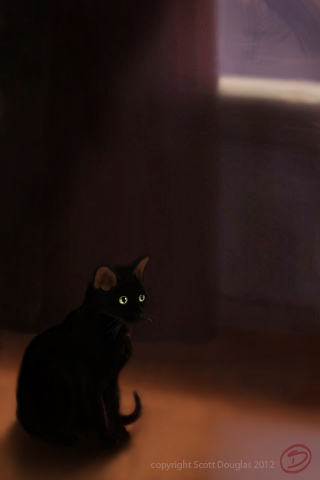 I have three other portraits in progress for this series (including one of my cat) which I will be posting soon. 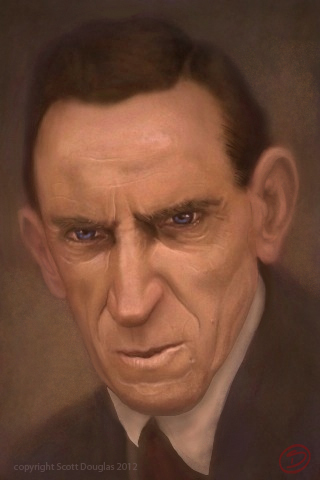 This is the first image of a second series of paintings made on an iPod touch. Part of the reason I’ve been doing portraits like this is I like the feeling of intimacy these pictures have, held on a small screen. It reminds me of the miniature paintings travelers would carry with them before the invention of photography. Portraits like that were often used as a form of introduction, or to have an image of a loved one with you when you couldn’t be together. After doing a number of portraits of people like this I felt compelled to do something a little different. 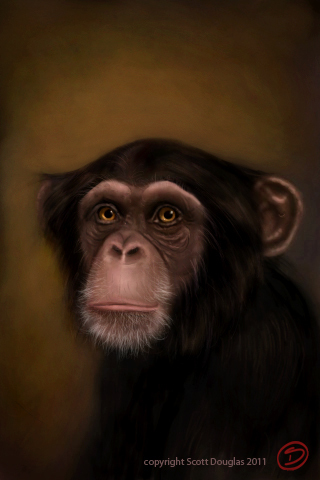 So here we have the first of a set of animals, in this case a chimpanzee. The challenge with this painting was to imbue it with a sense of presence, but not a human one.